Members of the Elementary Academic team are pictured above, from left to right, first row, Silas Boykin, Cannon Thrasher, Alli Latham, and Jed Groce. Second row is: Caleb Shepperd, Nevina Shelton, Addison Weston, Kassie Shelton, Jaelyn Moreland, Addison Coop and Gavin York. 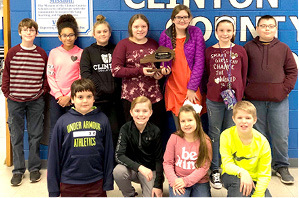 On Saturday February 9, the Elementary Academic Team competed in the 54th District Governor’s Cup competition at Metcalfe County Elementary. The team had a very successful day and brought home several awards, as a team and as individual competitors. For Quick Recall, the team earned 2nd Place and will advance as a team to Region on March 2, 2019. Coach Ashley Shelton said her team was very excited about their achievements. For Written Assessment, the following students placed. They will advance to Region to test in individual categories. The team earned the runners-up trophy for the district.